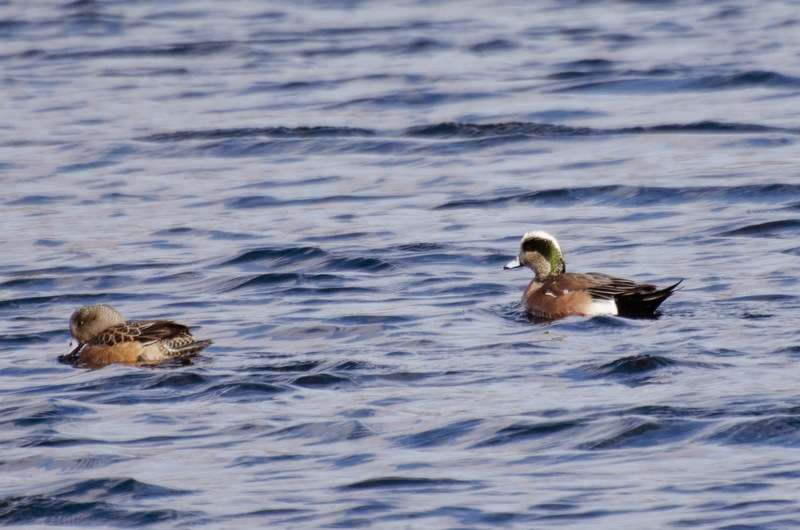 Last week I saw this pair of American wigeon ducks in the cold and partially frozen East River. The male is on the left. Click to enlarge. I spent the intervening time indoors nursing a cold and looking through old photos, and I found this shot of a pair in breeding plumage. The male, on the right, is sometimes called a "baldpate," which means baldheaded, because of the white stripe on its head. Something to look forward to! 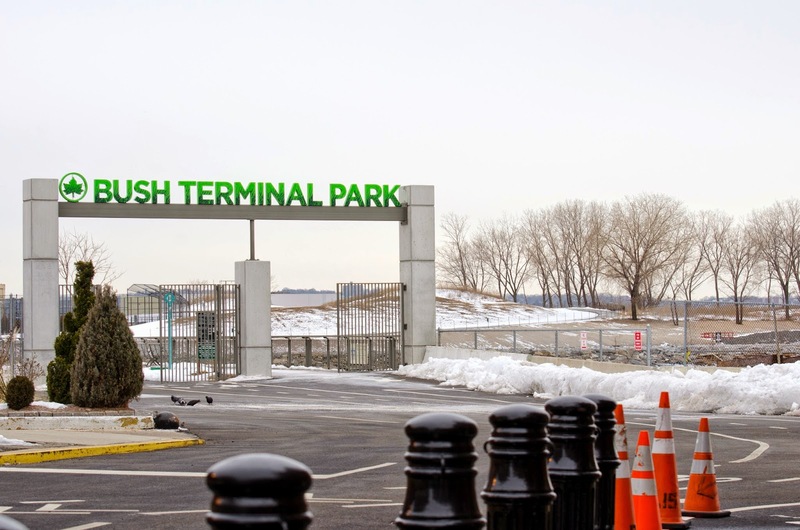 Tired of being kept indoors by the cold, I ventured out yesterday to look at this new Brooklyn park. It was pretty darned cold, about 25 F, and I didn't stay long. Click here for information about and directions to the park. Click here for a great place to have lunch while you are there. 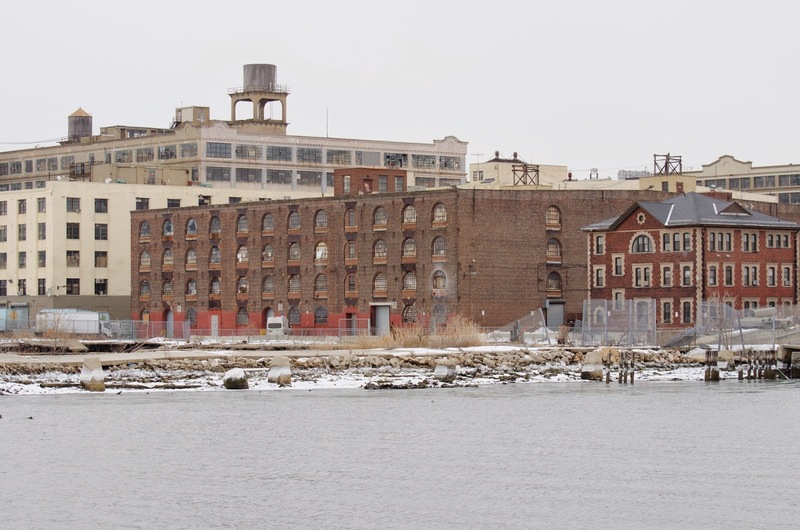 The park is surrounded by industrial waterfront buildings from an earlier age. Click to enlarge the photos. 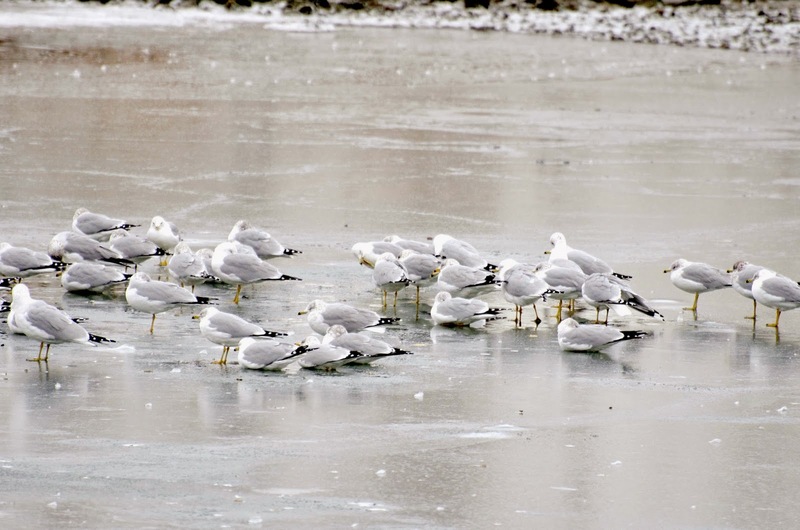 In the park, a flock of cold-looking ring-billed gulls, Larus delawarensis, were standing on the ice. 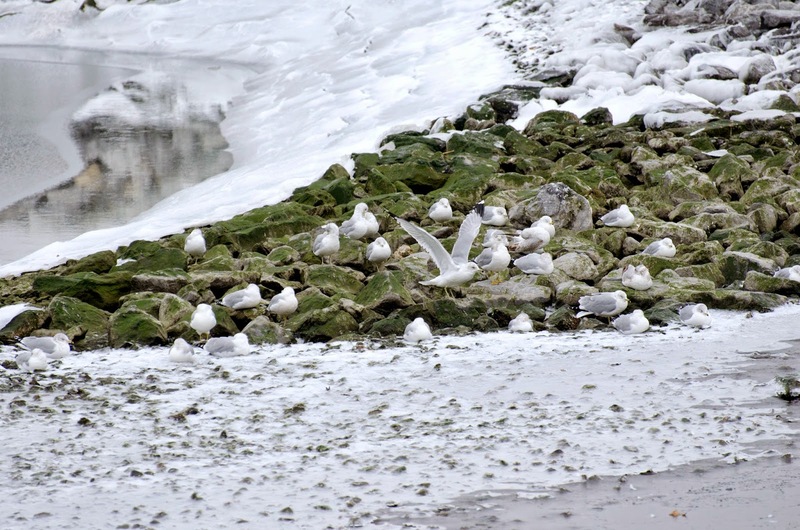 More cold-looking gulls hunkered down on the rocks. 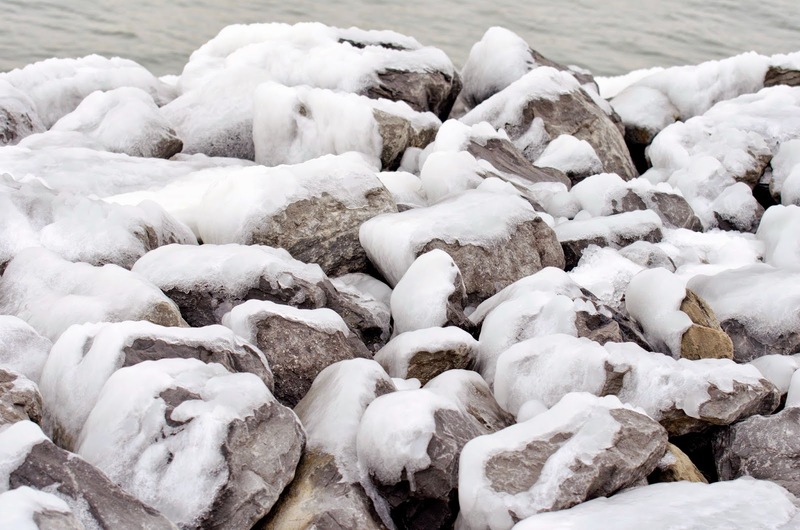 The rocks by the shore were icy. 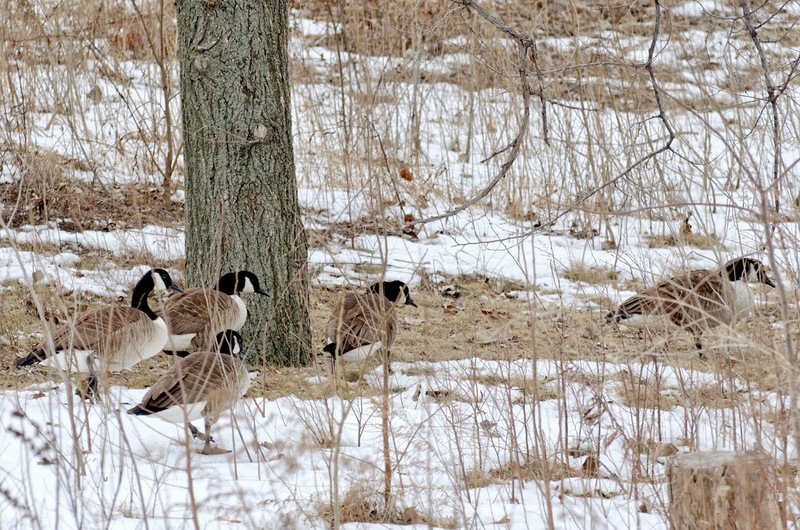 A few Canada geese, Branta canadensis, were walking through the dry grass. 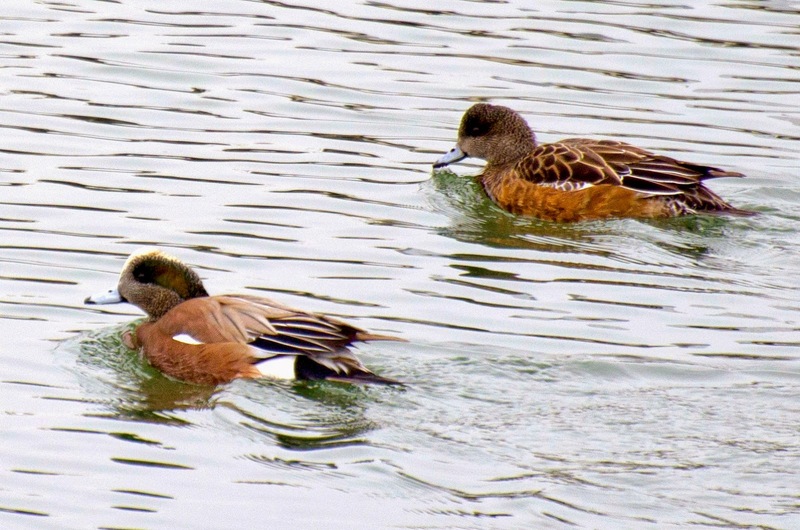 A pair of American wigeons (Anas penelope) swam by. The male is on the left and the female on the right. 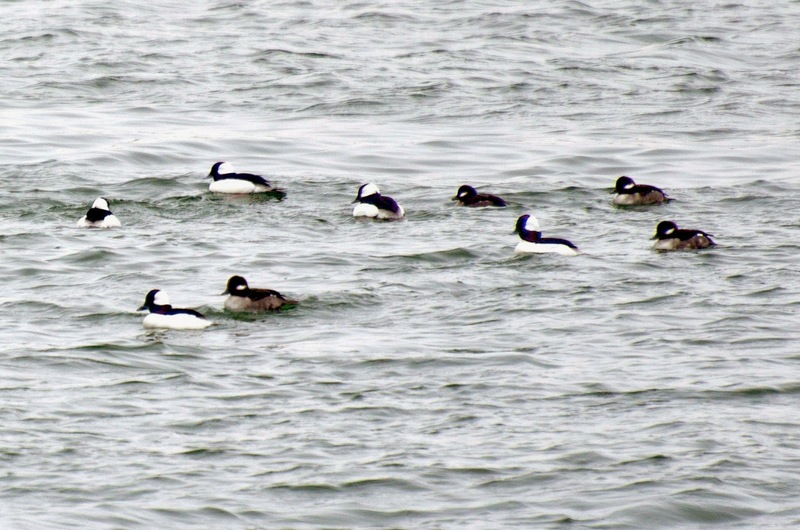 A few rafts of bufflehead ducks (Bucephala albeola) swam offshore. 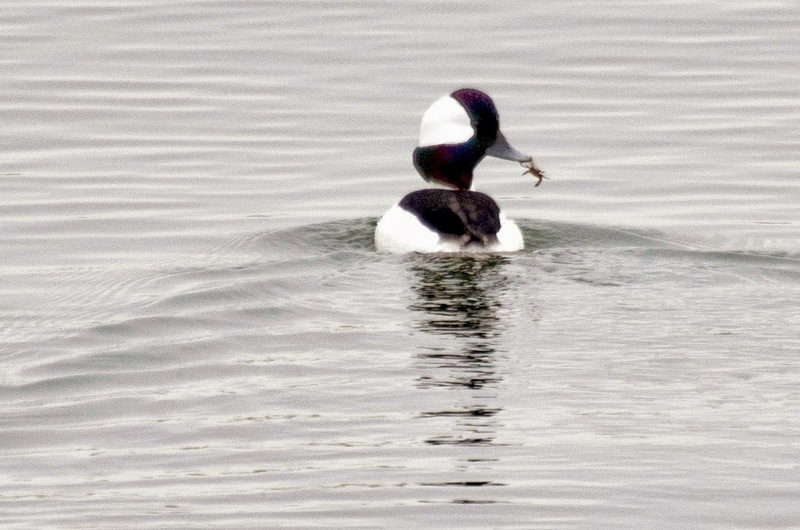 One of the buffleheads caught an arthropod snack! 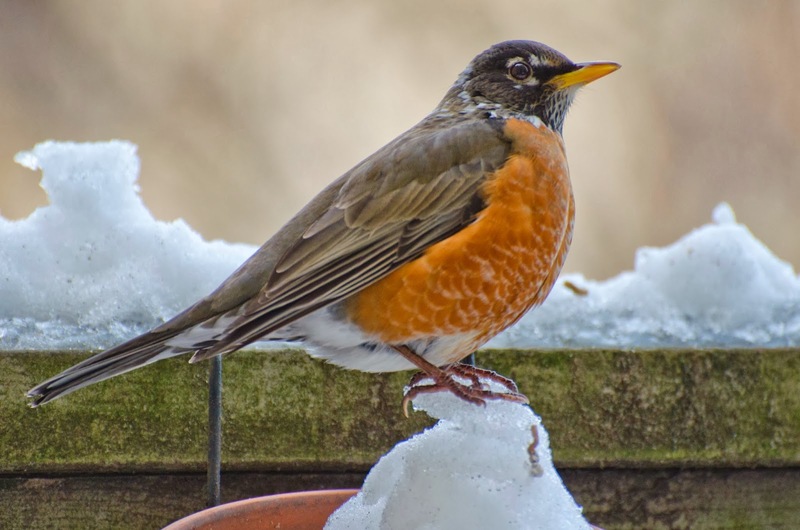 Some American robins fly south in winter, but many stay north. Their diet changes from worms and insects to dried fruit and berries. They seem to go away but they have just left the lawns for other foraging grounds. Click to enlarge. Here is one of my winter visitors from last year. One day last week there was a mockingbird perched outside my window in the cold, first thing in the morning. I opened up and threw some raisins on the surface of the snow. The mockingbird was eating when all of a sudden a robin appeared. The robin flew in so close that the mockingbird had to hop out of the way fast to avoid a collision. Then the robin spread its wings and rushed at the mockingbird. There was a brief fight during which they tumbled in the snow with wings flailing. The mockingbird ducked out from under and flew away. Then the robin ate a few raisins and flew to the fence where he sat with his chest puffed out for a while and then flew away. Shortly after, the mockingbird came back and had some raisins anyway. That afternoon, I looked out and noted the subzero temperature reading. There were sparrows on the fence, looking cold as the wind ruffled their feathers. All the raisins from earlier were gone so I tossed out a handful. A robin flew down and was eating when, to my surprise, an identical robin flew in and attacked. It seems that I have a couple of different winter robins visiting me for raisins, and one of them thinks my porch is his feeding territory and is trying to defend it. That's what robins do. In winter, when they rely on dried fruit and berries for food, some individuals defend a good food source alone while others form flocks and work together to defend a good spot. On a recent snow day in New York City, I trudged down to Montague Street, the main street of downtown Brooklyn Heights. Staring out the window over lunch I started noticing robins in a tree. 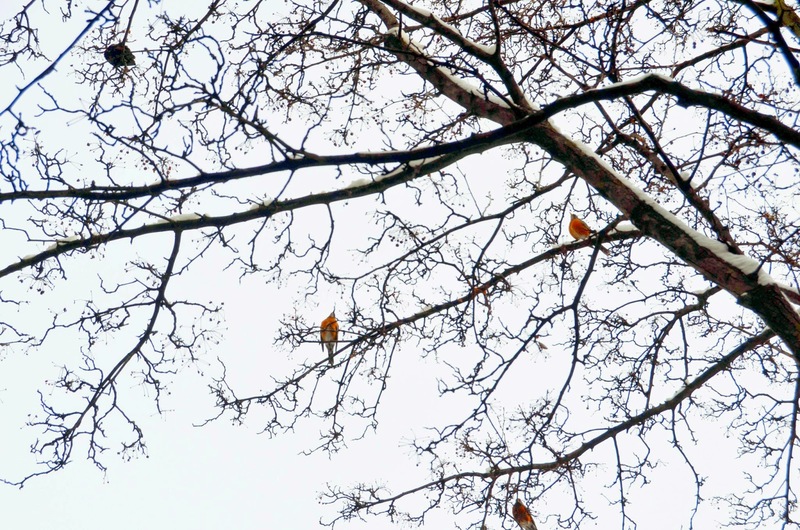 It slowly began to remind me of a scene from Alfred Hitchcock's The Birds, as I saw a second robin, and then more, and finally realized there were 10 of them in the same small tree. It was a fruit tree of some kind and they were eating the dried fruits. When the food is depleted they will search for another spot -- maybe they'll find the boundless cornucopia of raisins at my place. This is an osprey, Pandion haliaetus, sometimes called a river hawk, sea eagle, or sea hawk. 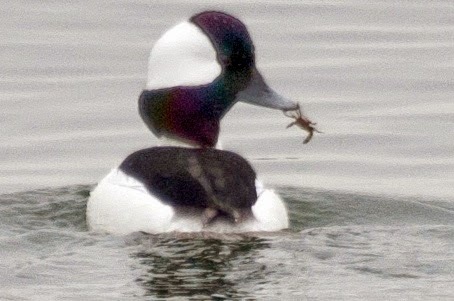 It nests near water and eats fish, diving with a dramatic splash and then rising with a fish in its talons. I have a $20.00 bet on the Seattle Seahawks in today's Superbowl game, so I am on their side. Nevertheless, I want to point out that the live raptor they use as a mascot, the one that flies across the field just before the team runs on, is an Augur hawk, a bird native to Africa. It eats mammals, snakes, lizards, and birds -- it's really a land hawk. OK, back to beer and nachos.